In contrast to nonspecific resistance, immunity (i-mu- ni-te), or specific resistance, is directed at specific antigens. An immune response involves the production of specific cells and substances to attack a specific antigen. Immunity has “memory,” that is, if the same pathogen should reenter the body at a later date, the immune response is quicker and stronger than during the first encounter. Lymphocytes play several important roles in immunity. An immune response involves one or both of two distinct processes: cell-mediated immunity and antibody- mediated immunity. During fetal development all formed elements are initially produced by the yolk sac. Later in fetal development the liver and spleen take over the production of formed elements. Around the time of birth the red bone marrow takes over the production of most formed elements, including lymphocytes. However, lymphocytes must mature and become specialized within primary lymphoid organs before they can participate in immunity. About half of the unspecialized lymphocytes pass to the thymus, where they become immunocompetent T cells. The other half of the lymphocytes become specialized in the bone marrow to become immunocompetent B cells. T and B cells are carried by blood to secondary lymphoid organs, such as the lymph nodes, spleen, and tonsils, where they proliferate to form large populations of T and B cells, and some are released into the blood. About 75% of circulating lymphocytes are T cells, and about 25% are B cells. All cells, including human cells, have surface recognition molecules called antigens. (Recall that antigens are used in typing blood.) In fact, the cells of each person have a unique set of antigens. Antigens are usually large molecules, such as proteins and glycoproteins. 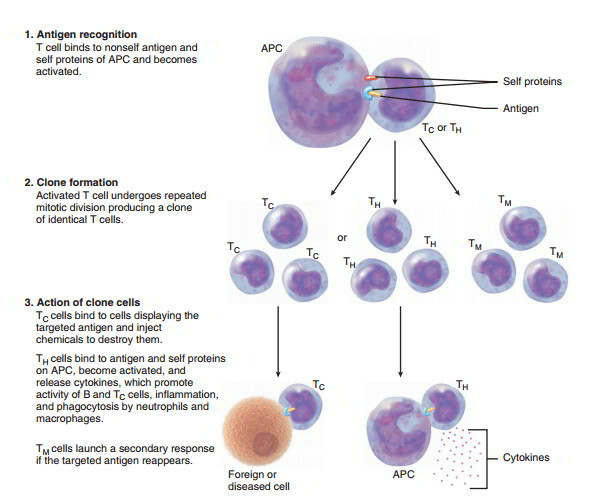 During the specialization process, lymphocytes “learn” to distinguish “self” antigens from “nonself,” or foreign, antigens. Thereafter, lymphocytes can recognize an invading pathogen or self cells with abnormal antigens, such as cancerous cells and cells infected by a virus, and launch an attack. Unfortunately, lymphocytes also recognize a transplanted organ as foreign, as in graft rejection, and in some cases fail to recognize certain body tissues as “self” and attack the body’s own tissues, as in autoimmune diseases. The maturation process produces thousands (and perhaps millions) of different kinds of T and B cells, each with specific receptors capable of binding with (recognizing) a specific antigen. Therefore, when an antigen of a pathogen or foreign cell enters the body, only the T or B cells that have a receptor that can bind with the specific antigen are involved in the immune response. In cell-mediated (cellular) immunity, T cells directly attack and destroy foreign cells or diseased body cells, such as cancerous cells, and develop a memory of their antigens in case they should reappear in the future. Cell-mediated immunity also destroys intracellular pathogens, especially viruses. A cell-mediated immune response begins when an antigen-presenting cell (APC), often a macrophage, engulfs a foreign (nonself) antigen and displays the antigen, in combination with its own self proteins, on its plasma membrane. When a T cell, which has been programmed during maturation to recognize this particular antigen, binds to the antigen and the APC self proteins, it becomes activated. The activated T cell undergoes repeated mitotic divisions to form a clone of identical T cells capable of binding with the same antigen that activated the parent T cell. If the activated T cell is a helper T cell (Th), it produces a clone consisting mostly of active TH cells along with some memory T cells (TM capable of binding with the same antigen as the activated parent T cell. When active TH cells bind with the antigen, they secrete cytokines (chemicals) that (1) attract neutrophils and macrophages to the site and stimulate their phagocytic activity, and (2) stimulate mitotic division and immune responses of activated B and cytotoxic T cells. If the activated T cell is a cytotoxic T cell (TC), it produces a clone consisting mostly of active TC cells along with some TM. When an active TC cell binds to any cell displaying the targeted antigen, it releases a lethal dose of chemicals to kill the cell. It then detaches and searches out and destroys other cells with the same antigen. As more and more active T cells proliferate and the pathogen is eliminated, the immune response slows and stops. The long-lived TM cells remain to launch a quicker and stronger attack if the targeted antigen should reappear. Antibody-mediated (humoral) immunity involves both B cells and TH cells. It provides a defense against extracellular pathogens. Rather than directly attacking foreign antigens, it involves the production of antibodies (proteins) that bind to foreign antigens tagging them for destruction by other means. B cell engulfs the antigens and displays the antigen on its plasma membrane along with its own self antigens. When a Th cell, which has been programmed to recognize this antigen, binds to this nonself antigen and self protein complex, the TH cell secretes cytokines that activate the B cell. The activated B cell produces a clone of identical B cells programmed against the same antigen. Most of the B cells in the clone become plasma cells but some become memory B cells. Plasma cells rapidly produce and release antibodies capable of binding with the targeted antigen. Antibodies circulate throughout the body in blood and other body fluids binding to the nonself antigens so they are more easily destroyed by phagocytosis and other means. After the pathogen has been destroyed, antibodies remain to provide protection. If the targeted antigen reenters the body, memory B cells launch an even quicker and stronger attack. Antibodies do not destroy pathogens directly. Instead, they bind to the antigens, forming antigen- antibody complexes that tag pathogens for destruction by other means. For example, an antigen-antibody complex involving bacteria or other cellular pathogens creates a site for binding complement, activating the same actions as described earlier in the nonspecific defenses section. Antibodies neutralize bacterial toxins by binding to the antigens, which prevents the toxins from attaching to receptors of body cells. Body cells escape damage because the toxins cannot enter the cells. Subsequently, the antigen-antibody complexes are engulfed and destroyed by macrophages eosinophils, and neutrophils. Antibodies are proteins known as globulins, so another name for antibodies is immunoglobulins, which have a shorthand designation, Ig. The structure of an antibody determines its classification and each class plays a special role in antibody-mediated immunity. The amount of each type and their specific functions are listed in table Below.